We publish an interview made to Giuseppe D’Alesio of SI COBAS, a delegate active in the struggles taking place in the Port of Naples against arbitrary lay-offs and lack of security in the port. The interview underlines the whole set of transformations that hit the workers in the last decades and points at the need to find conflictual strategies to cope with this flexible, precarious, unsecure forms of employement. The struggle for the reintegration of unjustly fired workers has gained the support of the unemployed movement of the city of Naples and of the porters and truck drivers of the region for a precise reason: against the divisions between employed and unemployed, between Italian and migrants, and between sectors of employment the goal is to fight for equal conditions for all, going against the logic according to which one can gain something only at the expenses of someone else. This challenge implies therefore to deal not only with the alliance between the employers’ blackmail and the government policies, but also with the sense of fear that is widespread among the workers themselves. The interview ends by pointing at the need to develop the already existing transnational connections and start new ones in order to tackle the logistical restructuring and precarization of labor at the European level and fight against the political conditions that produce divisions and fear. Looking forward to confront together these challenges at the next TSS meeting in Stockholm on the 23-24th November! As SI COBAS, when and how are you involved in the struggle at the port if Naples? What claims have been made by the workers? In the last 20 years the Port of Naples has undergone heavy renovations. At the end of the 1990s, national and local institutions transformed the area into a “free economic zone”: this has meant the liberalization of state property concessions, and has given more and more space and facilities to private individuals and speculators of all kinds. Until twenty years ago the main activity in the port was shipbuilding, which occupied thousands of workers who were the protagonists of important struggles for the conquest of better working conditions and wages. Since the 90’s the shipbuilding and naval-mechanical sector has entered a deep crisis, to the point that, out of more than 10,000 workers who were then employed on construction sites, today there are less than 500. In this period, because of these changes, the freight transport and terminal-container sectors began to develop. CONATECO was founded in 1996 thanks to an agreement between two industry giants, COSCO and MSC, and employs around 400 workers, some of whom were fired from nearby shipyards or from CULP, the historic cooperative of the Portuali [dockworkers] that had to deal with the consequences of the changes in the late 90’s and therefore had to heavily reduce the organic. From the start it was clear that CONATECO had the intention to make business on the workers’ skin: security inside the Terminal has always been below the standards set by Italian law, and over the years many serious accidents have occurred, including the death of a worker at work in 2008. Equally incredible is the fact that starting in 2013, CONATECO, led by the CEO Pasquale Legora De Feo, has started to take advantage of social security benefits and unemployment benefits (layoffs, CIG and CIGS) without ever being really in crisis. In practice, it uses funds for companies in crisis without ever having given a clear documentation of its economic situation, thus dumping the alleged losses on the state coffers and grabbing all the profits, even in violation of the safety rules. Since last year, about a hundred workers of CONATECO and SOTECO (the latter always managed by CEO Legora De Feo) have been fired despite until a few months before the company took advantage of the layoffs and therefore could not dismiss. The majority of these workers have accepted the economic offer made by the owners and have agreed to sign a “tomb” conciliation, where they therefore declared that they no longer expect anything from the company. The others, about 15, have refused conciliation offers and have embarked on a path of struggle both at the trade union level and at the legal level. These workers were fired illegitimately and with the most imaginative motivations: from those accused of having made a mistake during a single operation on containers, to those who were even accused of “poor performance”. In reality, the boss wanted to get rid of them because the peace of the layoff was over, and above all because these were workers who were not willing to accept the injustices, abuses and illegalities committed every day by the boss. In March 2017 these workers joined the base union SI Cobas, and together we carried out a struggle that still is ongoing today, inside and outside the gates of the Port. First of all, we want to restore the reinstatement of all the dismissed, without ifs and buts, the respect of the CCNL (National Collective Labour Contract) of the category and above all the respect of the rules on safety in the workplace. Unfortunately, in these years the workers CONATECO and SOTECO had no trade union’s protection: the unions present in the Terminal (CGIL, CISL, and UIL) have always accepted every maneuver and in 2015 they even signed the renunciation to the 14th month salary. In recent months we have developed numerous initiatives to fight and report outside the company, the Port Authority, the City of Naples, the Prefecture and the public television RAI, trying to shed light on this incredible situation. From January 2018, three of the workers of the SI Cobas obtained the sentence of reinstatement from the Tribunal of Naples, in particular the labour section, but they are still waiting to be able to return to work at CONATECO. How is the safety managed for the workers in the port? As SI Cobas, which initiatives have you taken regarding the security and working conditions for the dockers? To put it bluntly, we can say that within the Port, and especially in the CONATECO and SOTECO Terminals, the security is nonexistent. The rules established by the law 626 of 1994, by decree 272 of 1999 and 81 of 2008, impose a series of obligations for the company in order to guarantee safety in the workplace and to prevent accidents and occupational diseases. As SI Cobas we are in contact with the workers of CONATECO and SOTECO and found out that these laws are not respected: many workers are injured in a serious way, but the company tries in every way to avoid the facts; some workers have experienced serious illnesses such as tumors due to inhalations of exhaust gases, or loss of hearing due to loud noises. Terminal Containers are in a state of decay: structures such as the gates are crumbling, and above all the means of transportation are semi-destroyed, which makes driving difficult and causes numerous accidents. The most incredible thing is that these incidents (accidents, illnesses, etc), instead of pushing the company to comply with safety regulations, have been used as an excuse to fire workers, accused of distraction or lacking performance. In recent months we have reported this serious situation to the Port Authority of Naples, the municipality and the Prefecture, with photographic evidence of the situation of deterioration inside the Terminal, but still nothing has been done to improve the safety. How did the confederal unions react when the struggle took off? Are workers afraid of organizing themselves in the union? The confederal unions in the Port, Cgil-Cisl-Uil and Ugl, have the biggest number of members, but their presence is almost nonexistent. They act only when there are mass lay-offs, otherwise they accept every abuse and every will of the bosses. The real problem, however, is not the conduct of the confederal trade unions, who generally behave like this in the labour market, but rather the fear that is spread among the workers. Many workers have been hired thanks to recommendations made by the unions themselves and therefore they are afraid to rebel. Are there any similarities to other labour conflicts in Naples – such as the conflict at the Fiat FCA car factory in Pomigliano? Are there any connections with other struggles within the logistics in Italy and in Europe? The similarities between the dismissed of the Port and the five FCA dismissed from Pomigliano are obvious: even the FCA won the case in court and the judge ordered the reinstatement of the dismissed people, these workers haven’t set their foot in the factory. Unfortunately a few weeks ago the Court of Cassazione [the highest Court in Italy] overturned the sentence of the appeal judges and found the bosses not guilty. In the port, on the other hand, we are still struggling: the court of first instance has given the workers the right to order reinstatement for 3 CONATECO workers, while another 3 or 4 of them who will be soon heard by the judge have a good chance to win their cases. The problem is that Pasquale Legora De Feo, who has appealed on appeal, has so far not called to work anyone of the previous dismissed, even if they have won the appeal. It is clear that the bosses use this strategy to continue to take out the reintegrated because they are afraid that the latter, when returning to work, become points of reference for all the other workers in the Terminal, and therefore manage to organize a real trade union struggle. Pasquale Legora does not want the presence of the union in his company, and for this reason he continues to keep the dismissed out of the port, following the example of Marchionne at FCA factory. Regarding the logistics porters, the relationship with dockworkers is very tight for two reasons: 1) SI Cobas has a widespread presence within logistics, and our porters often move around Italy to support the struggles of the other SI Cobas workers; 2) the work of the terminal operators is very similar to that of the porters, because both categories operate in the transport-goods sector, even if they are part of two different CCNLs. In Campania the workers of the TNT of Teverola and Casoria are very active: these until 2014 were working in semi-slave conditions, even without holidays and sick leave. Today, after the entry of SI Cobas in the warehouses, the working conditions improved to the point that workers earned almost double the salary they received 5 years ago. This also applies to drivers and hauliers. 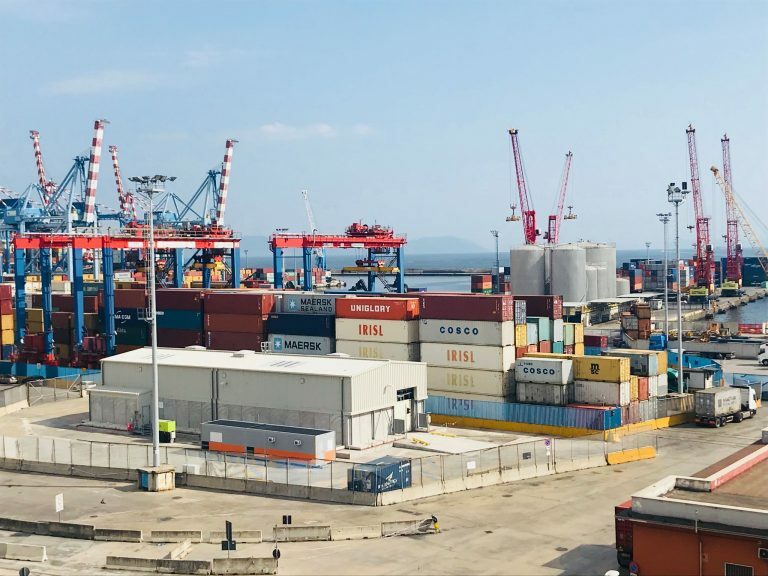 In the port of Naples, when we organize strikes or actions, we often talk to truck drivers who complain of inhumane working conditions and starvation wages. Often they are framed as cooperative members, but it is only a fiction. In the logistics, the same situation is widespread, and with the struggle in many cases we manage to undermine it and regain better rights and higher wages. Now it is a matter of extending and spreading these conquests also within the Port of Naples and in the interports of Southern Italy, starting from that of Nola where we have been working for some time as SI Cobas. But as I have already said, the first enemy that workers especially in the South must defeat is the fear of fighting and striking for their rights. Did you have support from other movements in Naples, for example the unemployed movement “7th of November”? How? First of all it must be said that in recent years, unfortunately, many of the realities of the left have put in the background, or even completely abandoned, the intervention on the workplace and in the workers’ reality, especially in Naples and in South Italy. The confederal unions have been carrying out numerous counter-reforms of the labor market that have dismantled and destroyed that system of rights and achievements resulting from the struggles of the ’60s and’ 70s. Often when they are present in social and trade union conflicts, they are dismantling the struggle and selling off the interests of the oppressed workers and classes. SI Cobas moves in the opposite direction to this trend: for us the center of the conflict remains in factories, warehouses and in the countryside, that is where the heart of wage exploitation is found, where we work for 4-5 euros per hour without rights and without protection, where the bosses make profits on the skin of the majority of the population. Our union was born and grew up in the logistics sector and has reported numerous victories that have improved the salary and living conditions of thousands of workers. In the South – where one of the biggest drama is that of unemployment – we are gaining support from the movement of the organized unemployed. In particular, with the movement “7 November”, born in Bagnoli in 2014, there has always been a relationship of collaboration and unified action. From them came the greatest support for the workers’ struggle in the Port of Naples. The “7 November-movement” of unemployed workers supports this fight not only as an act of solidarity. They understand that as long as there is exploitation, blackmail and fear within the factories and warehouses, there is also no possibility for those without work to improve one’s condition. Today the Italian government makes promises on the income of citizenship, but in reality they want to blackmail the unemployed with an alms and then force them to accept any kind of precarious and underpaid work – or even – as stated by the Minister of Labor Luigi Di Maio a few days ago, to work for free 8 days a month. Our action is aimed at unmasking these measures, which are a real scam, and to send a message to the oppressed and exploited working class: we must undertake a united struggle against the divisions carried out by bosses and governments, Italians and migrants together, employed and unemployed, to demand full salaries and equal civil and social rights for all. For this reason the unemployed “7 November-movement” is present in every initiative of the dismissed of the Port and support the struggle. Are there any other actions coming up? The mobilization continues every week: a few days ago we called for a press conference inside the premises of the Municipality of Naples, where we once again reported to the press the illegitimate lay-offs and showed the photographs that testify to the condition of degradation inside of the Terminals. A few days ago there was an action just outside the CONATECO terminal. For half an hour workers and activists blocked the entry of the trucks. In the coming weeks there will be new mobilizations, which at this moment we are still discussing and evaluating. Do you have transnational connections with other dockworkers and base unions? In Italy the trade unions in the ports are quite weak. Almost everywhere there is a majority presence of CGIL-CISL-UIL, and therefore no significant struggles. We have contacts with the Marghera Fincantieri workers, who however are in the shipbuilding sector, and we are trying to build contacts with Livorno and Sardinia. It is not an easy job and in this category we are starting from practically zero, but we are soon counting on setting up the first forms of connection at a national level. Internationally, SI Cobas is part of the international trade union network of solidarity and struggle, which also includes the Brazilian union Conlutas. For some years we have also met with some rank-and-file trade union organizations such as the Spanish CGT and Solidaires in France, with whom we are trying to build a broad European-wide coordination. However, we are open to a wide discussion with all those realities that, starting from the immediate and material interests of the working class, intend to really stand on the path of class autonomy and break with capitalist compatibility and want to strengthen and coordinate the struggles on an international and internationalist plan. for us the center of the conflict remains in factories, warehouses and in the countryside, that is where the heart of wage exploitation is found, where we work for 4-5 euros per hour without rights and without protection, where the bosses make profits on the skin of the majority of the population.